Ciao! My name is Morena Hockley and I am the crafty mind behind the tutorials at Morena’s Corner. I love to share ideas for projects that are fast, frugal, and fabulous: easy on time and money, and great to look at! I am a stay at home mom to four young children, and crafting is what helps me maintain my sanity. In a past life I was an elementary school teacher and an assistant principal. I miss teaching, so my blog is in a sense my virtual classroom. I hope you’ll swing by to check out my corner! You can also find me on Facebook, Twitter, and Pinterest! 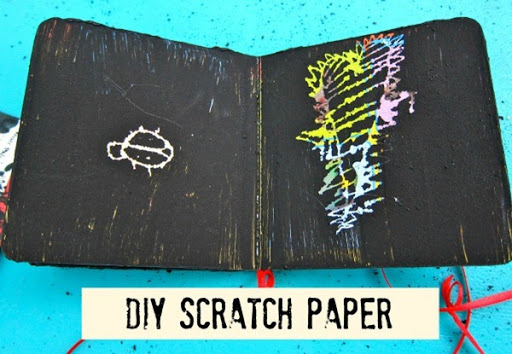 Today I’m thrilled to show you how to make your own scratch paper and scratch books. This was a favorite project when I was in the classroom, but I used to have the students color their own paper with crayons. That was time consuming, so I found a way to make it faster and recycle at the same time. I found that board books and the covers from paper back books work really well with this project. Catalog covers and junk mail are good, too, as long as the paper is sturdy and glossy, like a calendar page. I didn’t have any spare calendars to use, but I will be saving them in January to use for this project! 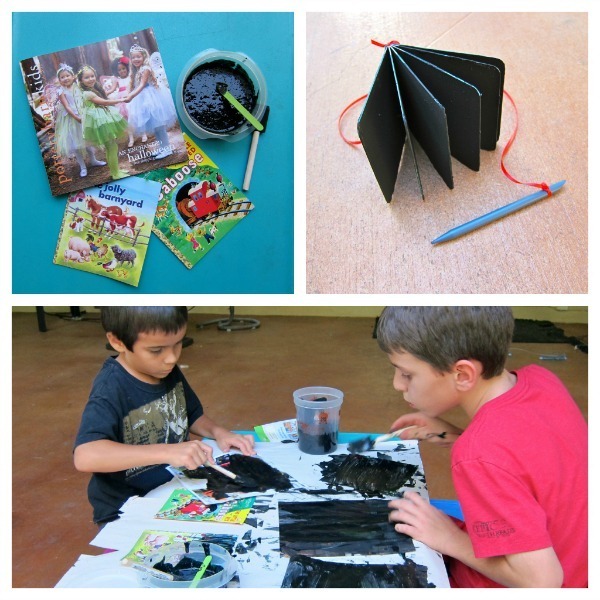 Mix the soap into the paint, and cover the entire page with paint. They painted one thick layer of paint and let it dry. After the paint has dried, the kids are free to scratch away and reveal the bright colors underneath! I used a stylus, but my children preferred using sandwich toothpicks, and even small sticks from the yard. Some of them drew pictures and designs, while others just wanted to reveal the picture underneath. Either way, it kept everyone (even my one year old!) entertained for a long time. I hope you enjoyed my fast, frugal, and fabulous tutorial, and that you’ll stop by my corner to see my other projects! Some of my popular recent posts include slime making, DIY carnival games, and making glass look like pewter. I hope you’ll take a time out in Morena’s Corner! I am so glad to have you here today! Thank you for such a great craft. I am a huge fan of your site. I’m truly flattered! Thank you. 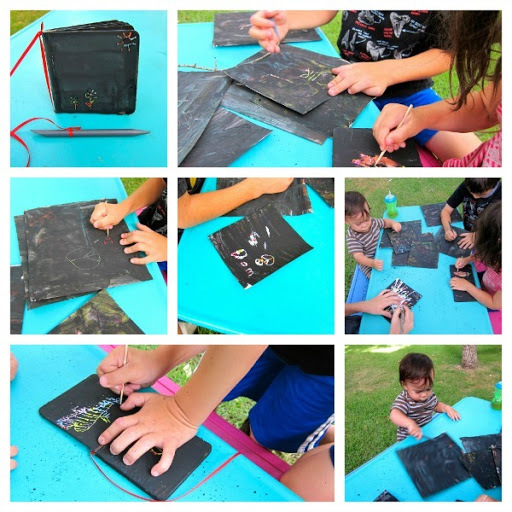 I thank you and my kids will thank you for sharing this fun tutorial! Can’t wait to try it for my 3 and 6 yr old girls. Thank you! I hope your girls enjoy it as much as my kids did! This is so cool! You did a great job! I love this! My daughter loves doing this, but my way was much more involved. I would take a blank piece of paper, draw and color all over it, take a black crayon and color on top of that and then let her scratch away. One little picture would take an hour to make! I’m definitely doing this!! Thanks so much! That is exactly how I used to do it with my students. It took forever! 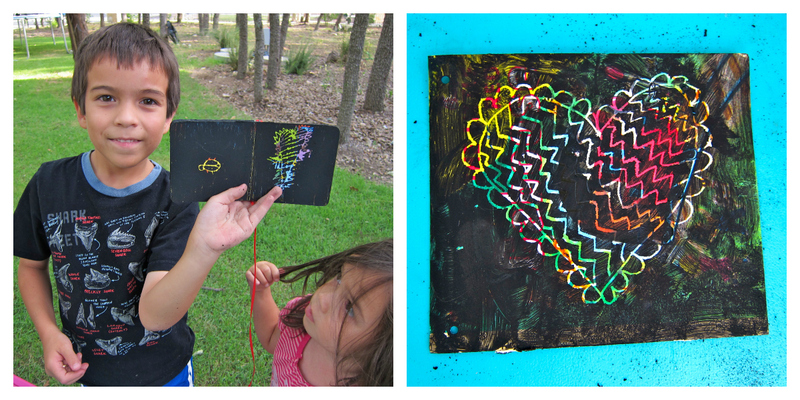 We painted outside and in our hot Texas heat, the pages dried very quickly. I’m glad you’re going to try it. Have fun! I love kids work.. they started painting work……. Thank you! I love kid’s artt work, too. I have done this before, but didn’t use the dish soap. What is the reason for the dish soap? Thanks. The soap makes it easier to scratch the paint off. If you are using heavily laminated paper you can probably omit the soap! So this was great. I laminated my kids old pictures and painted over them. they go a kick out of guessing who’s picture was underneath. Ashley, what a great idea! I can’t wait to try that with my kids! Great Idea! I laminated some of the kids old drawings and paintings. Then I painted over the pictures. They got a kick out of guessing who’s picture was underneath. Just found some old board books. This will be a fun and doable project for the little ones in my life. Your way is so much easier than the old crayon method. Thanks so much for sharing. And I hope to laminate some art work like Ashley suggested.